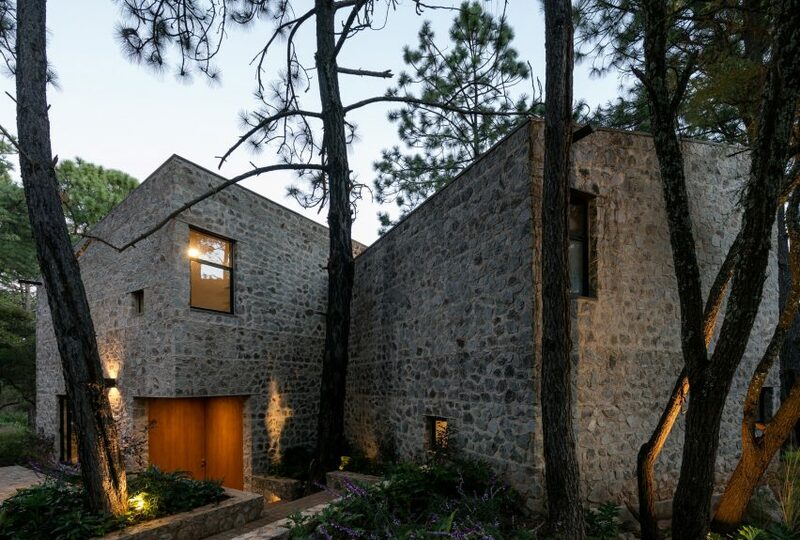 Mexican architects AM40 Taller de Arquitectura and Stephane Arriola have completed a vacation home in Jalisco, using traditional materials and aiming to disturb the site as little as possible. 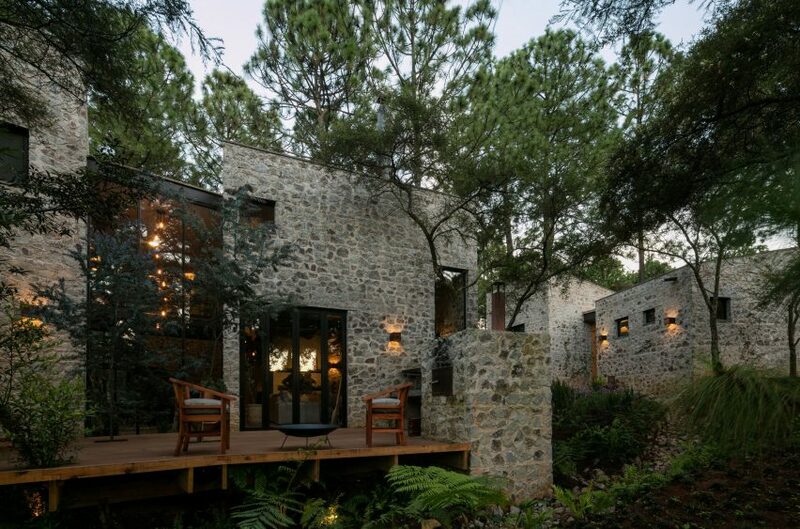 Casa EC was created for an urban family seeking a natural escape. It is located in Atemajac de Brizuela, a small town roughly 100 kilometres (62 miles) outside of Guadalajara. The 385-square-metre residence is made up of five rectangular volumes that cluster around a central courtyard. “Our approach was adapting to the natural elements on site, splitting the programme into different volumes and placing them around the existing pine trees,” said the architects. Two of the boxes, at the southern end of the site, contain a total of three guest bedrooms. Separating these areas from the rest of the home gives visitors more privacy, and allows the courtyard to act as a gathering space. 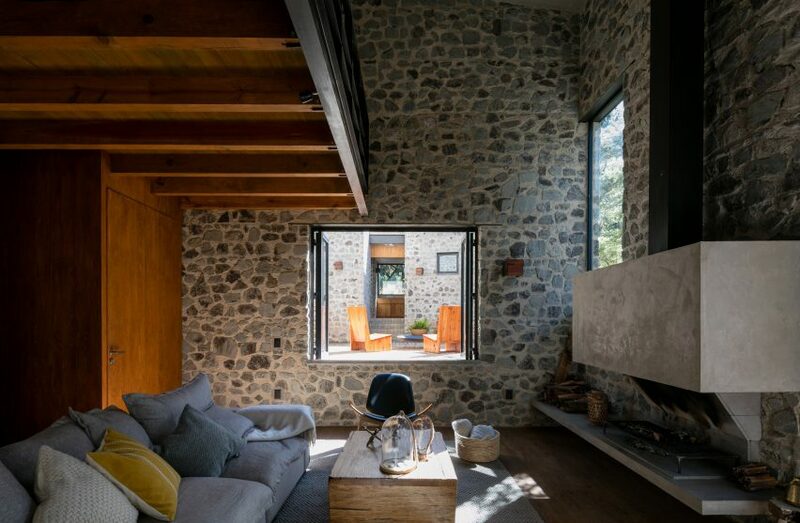 “A terraced courtyard functions as a central plaza linking the front and back of the plot, as well as creating a space for interaction between the main house and the guest rooms,” the team said. 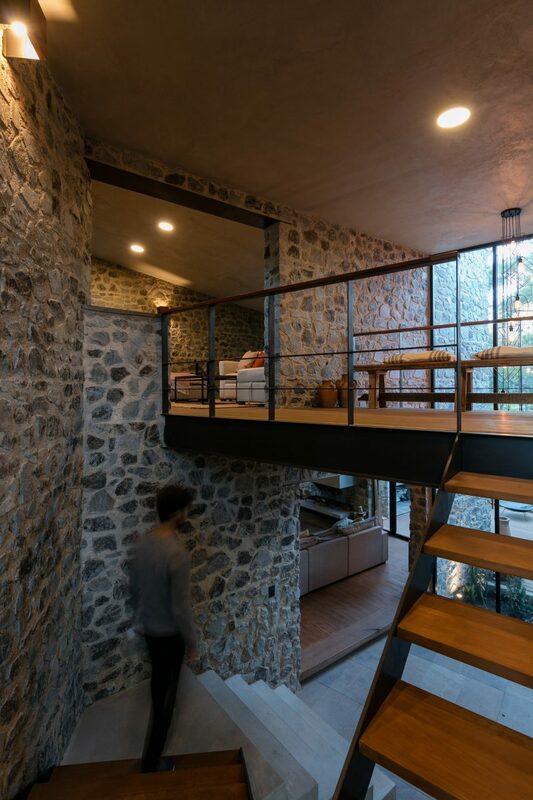 The three other volumes form the main portion of the home, and are arranged around an exterior circulation staircase. Living and dining areas are split up, and because of the level changes on the site, are separated by short flights of steps. “The main floor adjusts to the terrain surface and inner patios provide light and ventilation, creating atmospheres with unique characteristics,” said the architects. Two bedrooms are located on the upper level, as well as a secondary sitting area that overlooks the main living room. The children’s bedroom is also located on a mezzanine, which sits above a lounge area that enjoys access to an interior courtyard. In designing Casa EC, the team sought to maximise connections between living spaces and exterior spaces. “Hardwood flooring was used to create a continuous surface that extends the public spaces into outer decks, reinforcing the interaction with the surrounding vegetation,” they said. Their approach was to combine traditional materials and contemporary forms. Local stone was used for the exterior, while simple volumes and angled rooflines give the residence a contemporary appearance. 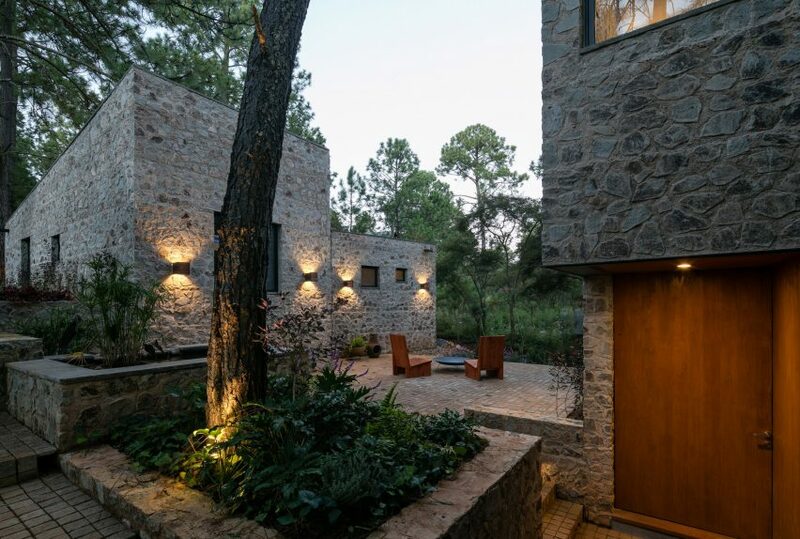 AM30 Taller de Arquitectura was founded in 2014 in Guadalajara by Bernardo Hernandez and Maria Emilia Sartoris. The studio collaborated with Mexico-based architect Stephane Arriola on the project. 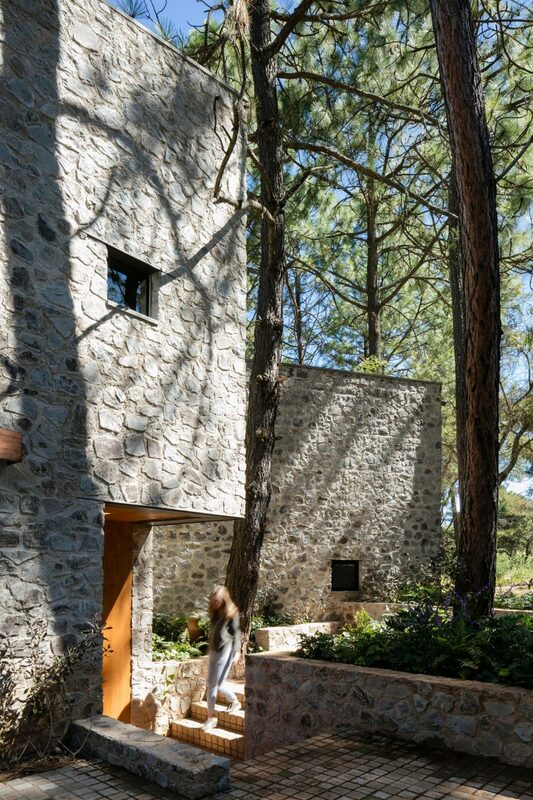 Other homes in the western region of Jalisco include a stable by AE Arquitectos built out of volcanic rocks and a minimalist home organised around an atrium filled with trees by Abraham Cota Paredes. Photography is by Lorena Darquea Schettini.